When abracadabra is a favorite word in your child's vocabulary, or Harry Potter books consume his or her reading list, a magic themed birthday party seems like the logical solution. It's a party theme with a myriad of creative ideas that is sure to create a magical time for the guests. A 3x5 or 5x7 one-panel invitation in black can work for a magic themed party. Use white text to include the party details. You can also use magic symbols, such as a top hat, white gloves, and/or a magic wand as background or border photos for the invitation. Personalize candy bar wrappers with the party details. Invited guests can "discover the magic" of the details when they unwrap the chocolate bar. You can hand deliver the chocolate bars or send them in a padded envelope or small box via the mail in cool weather. For a Harry Potter magic party, recreate the acceptance letter to Hogwarts that Harry receives. Print the party details on an 8.5" x 11" piece of paper. Roll the paper into a scroll and tie with a red ribbon. You can hand deliver the invitations or mail them in small mailing tubes. 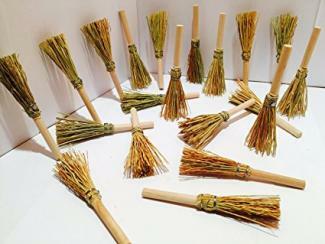 You can also buy small brooms from your local craft or home goods store. Use a paint pen to write "Firebolt" on the handle to reference Harry Potter's second broomstick. Attach a card stock with pre-printed party details to the handle with a ribbon or piece of raffia. You can have your child hand deliver the invitations to their friends and invited guests. Decorations will help bring the theme to life. Entrance - Use a sign at the entrance of the party that looks like the sign on a theater. The sign can include your child's name and say something such as, "The Show Is About to Begin," or something similar. Table centerpieces - Place a black top hat, a pair of white gloves, and a magic wand in the center of each guest table as a centerpiece. Place settings - Place a pair of gloves, a magic wand, scarves tied together, doves, dice, or connected "magic" rings at each place setting. Attach a place card to the item to serve as a seating card. Additionally, the guests can take these items as party favors. Basic table decorations - Cover guests and food tables with black and white table covers. 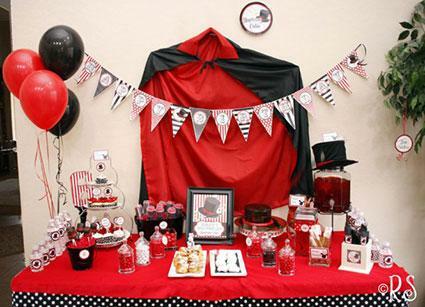 You can use red accents, such as red bows on tied around the backs of the party chairs at guest tables. Place black top hats with white plush bunnies coming out of the inside of the hat as decorations for the food and beverage tables. Area decorations -Tape individual playing cards to walls, tables, and chairs. Alternate the cards so that some have the face of the card showing, while others have the back of the card showing. You can also dangle cards from fishing line from the ceiling of the party room. Hang knotted scarves around the room as well. 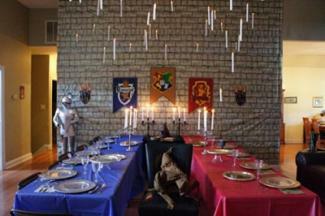 For a Harry Potter party, recreate the Great Hall. Set up tables and chairs so it is family style, similar to the dining facility at Hogwarts. Hang one-bulb, cordless tapered candle lights, similar to the ones used in windows at Christmas from the ceiling. Brookstone offers a selection of the candle lights without cords that you can use. Add fishing line to them and hang from the ceiling to create the same effect as the movie. Turn a stack of books, a stuffed owl, stuffed rat, and stuffed cat into a table centerpiece for a Harry Potter party. The owl is Hedwig, the rat represents Scabbers, and the cat is Crookshanks. The stack of books can be stacks of Harry Potter books or a stack of magic books. Hire a magician to come and perform tricks to entertain the children (and the adults). Look in the local phone book or online for party entertainment-magicians are typically one of the categories available. Have strolling magicians mingle through the party. Each can perform a specialty trick as they mix and mingle with guests. 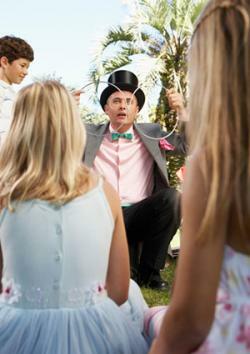 Some magicians can work with the kids to teach them how to do the magic tricks on their own. Turn the kids into magicians by teaching them easy magic tricks. Provide the props and tools they need. Help each child learn how to perform their trick. Then, have the children put on a magic show for the other party attendees. For a Harry Potter party, have your guests come dressed in costume as their favorite character. Hold a contest and hand out awards for the most creative, best costume, and best actor. You can also assign guests a character when you send out their invitation. Have them make a costume and award the best dressed and most creative for their costume creations. Another activity for a Harry Potter party is to set up a temporary tattoo station. Have the tattoo artists give guests lightning bolt tattoos. Turn stick pretzels into magic wands. Dip one end of the pretzel sticks into chocolate and roll in white sprinkles. Make sandwiches and use a bunny-shaped cookie cutter to shape the sandwiches into magic rabbits. Serve foods that are magic wands because of their shape. Some foods to consider include fish sticks, chicken fingers, and hot dogs. Serve punch and tell the kids it's a magic potion; the more colorful the punch, the better. 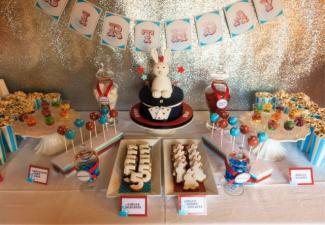 Magic party cakes can range from a white rabbit coming out of a magician's hat to a cake in the shape of a magician's hat, with a magic wand, and white gloves on lying on the hat. Serve up magical desserts, such as magical bunny ice cream balls made using ice cream snowballs and candies for the bunny's features as described by The Magical World of Bill Jackson. Let the children feast like the kids at Hogwarts. Put out platters of food that they can assemble themselves. The fixings for pizza or tacos can work. Even platters of cold cuts, condiments, and breads that the children can make into sandwiches can work for a Harry Potter party. Harry Potter birthday cakes can be shaped, such as in the shape of a sorcerer's hat or Hedwig the owl. Another option is a sheet cake with the characters on top of the cake. Butterbeer is the must-have drink. Look for copycat recipes online that resemble the popular drink from The Wizarding World of Harry Potter at Islands of Adventure in Florida. 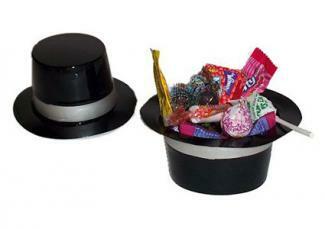 Fill black top hat favor holders with candy. Slide each hat into a cellophane bag and tie off with a black ribbon. Attach a personalized tag with your child's name and the date of the party. Guests can "unwrap the magic" when they arrive home to enjoy a sweet treat. Magic tricks or a book of magic tricks make great favors. The kids can test out their magic skills while they're at the party and later at home. Even a deck of cards can be a great favor so that kids can learn card tricks. Harry Potter fans love to take home Muggle candy. Fill cellophane bags with bubble gum balls. Add a label to the bag that says, "Drooble's Gum Balls." Whether it's a general magic themed party or a party with a Harry Potter influence, the kids are sure to have a magically good time. With a bit of creativity on your part, you can infuse magic into the party, starting with the invitations and carrying it straight through to the favors guests take home at the end of the event.